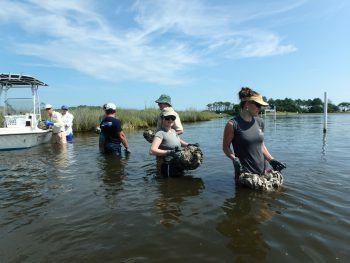 Wednesday, July 27 was a hot day, but that didn’t deter the wonderful volunteers in Manteo from completing an oyster reef in Shallowbag Bay on Roanoke Island. Six volunteers came out for a fun-filled morning, and started out the day by moving crab pots and collecting buoys from a storage site to bring out to the North Carolina Coastal Federation’s reef site. The volunteers also loaded bagged oyster shells on the boat to bring to the site. Laura Speer was among the reef construction volunteers. Speer is an AmeriCorps member at the North Carolina Museum on Natural Sciences in Raleigh. As part of the Conservation Trust of North Carolina’s AmeriCorps program, Laura was able to come out for the day to shadow Erica Connery, the AmeriCorps member serving with the federation’s Northeast office. It was a great day to be out on the boat, and with the help of the volunteers, the federation was able to place all of the bags to complete the final section of the reef. “Before heading back to the office we took a look at one of the re-purposed crab pots put out in a section last year and we were able to see some spat already growing on it, which was really exciting,” Connery said. Seeing spat is a sign that oyster growth is happening. The crab pot recovery program uses lost crab pots and re-purposes them for oyster reefs. The program recently received $100,000 in state funding to continue expand the scope of the project. To learn more, visit nccoast.org/crabpot or call Ladd Bayliss at (252) 393-8185.